This Week In DOCTOR WHO History: Oct 16th to Oct 22nd | Warped Factor - Words in the Key of Geek. 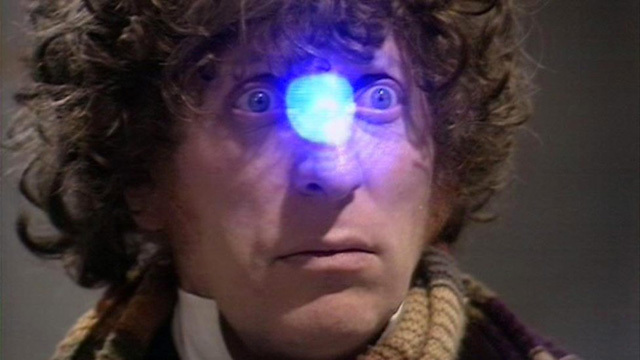 What do we have for you this week in Doctor Who history? Only record-breaking viewing figures and not one but two (sorta) spin-offs debuting, that's all! We get things underway this week in Doctor Who history with the first episode of The Myth Makers, titled Temple of Secrets, which was broadcast on this day in 1965 at 5:50pm and watched by 8.3 million viewers. Eleven years later, part three of The Hand Of Fear was watched by a very nice 11.1 million. That story, of course, featured fan-favourite companion Sarah Jane Smith, and her own show The Sarah Jane Adventures also has an episode broadcast on this day. That would be part two of Prisoner of the Judoon which was broadcast in 2009 and watched by 0.82 million viewers. O this day in 2011 episode one of The Sarah Jane Adventures story The Man Who Never Was aired for the first time on CBBC at and was watched by 0.71 million viewers. Then, just last year in 2015 the Twelfth Doctor adventure The Girl Who Died premiered, and there was good news for series nine. 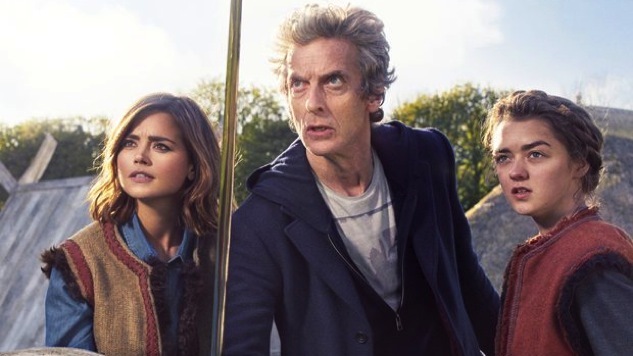 Doctor Who came second for the day in the UK viewing charts with 4.63 million viewers in overnight ratings, an increase from the previous episode. Overall the final consolidated ratings were 6.56 million viewers, the highest figure of that series thus far. 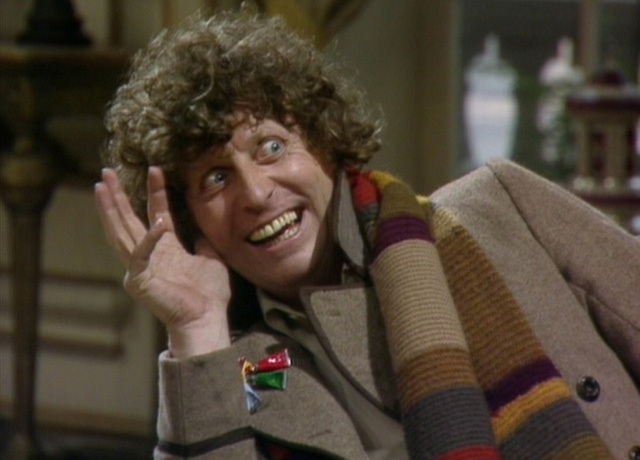 Firstly on this bumper day in Doctor Who history we have two fourth and final episodes from two Fourth Doctor stories. October 18th 1975 would see a very nice 10.1 million viewers tune in to the closing chapter of Planet of Evil, however five years there was but 4.7 million watching the last part of Meglos. Two regenerations later and the Sixth Doctor is still standing The Trial Of A Time Lord. The installment broadcast on this day in 1986, part seven of the overall arc, was episode three of Mindwarp which was watched by 5.1 million viewers and broadcast at the ridiculously early time of 4.47pm! Our weekly Scottish Doctor's section is made up of part three of Ghost Light and last year's Flatline. The Seventh Doctor adventure was broadcast in 1989 to just 4 million viewers, whereas the Twelfth managed to command an audience of 6.71 million. Finally for this day we have two episodes from The Sarah Jane Adventures (natch). From season 4 we have episode one of The Vault of Secrets, broadcast on October 18th 2010 and watched by 0.73 million viewers. The following year episode two of The Man Who Never Was drew an audience of 0.6 million. Two from the Seventh Doctor today, starting with part three of Paradise Towers which was broadcast in 1987 and watched by 5 million viewers. 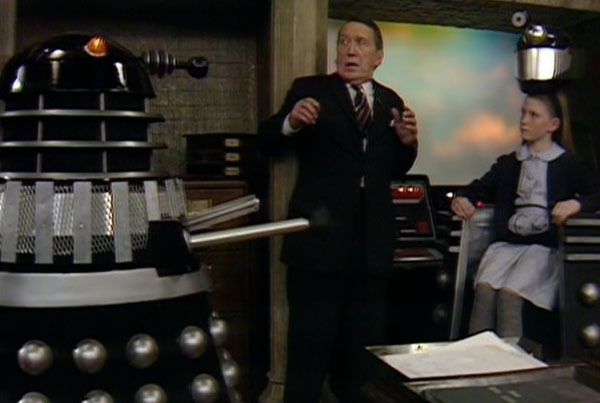 The following year part three of Remembrance of the Daleks fared slightly better with 5.10 million. And where would a day be without a dose of The Sarah Jane Adventures? This time it's episode two of The Vault of Secrets which was broadcast in 2010 at 5:17pm, and watched by 0.61 million viewers. Sorry - I just had to run the clown picture again! 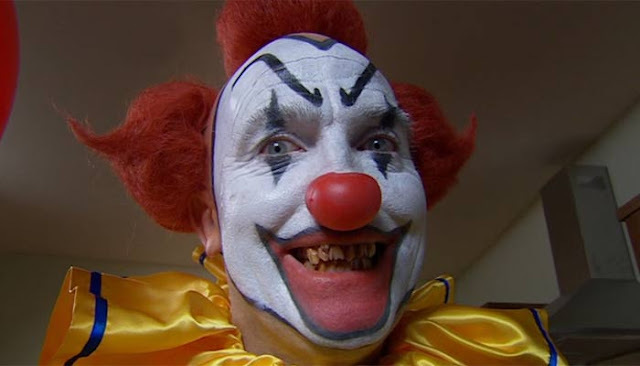 That's from episode two of, what else but, The Sarah Jane Adventures story The Day of the Clown, which was broadcast in 2008 and watched by 0.76 million viewers. 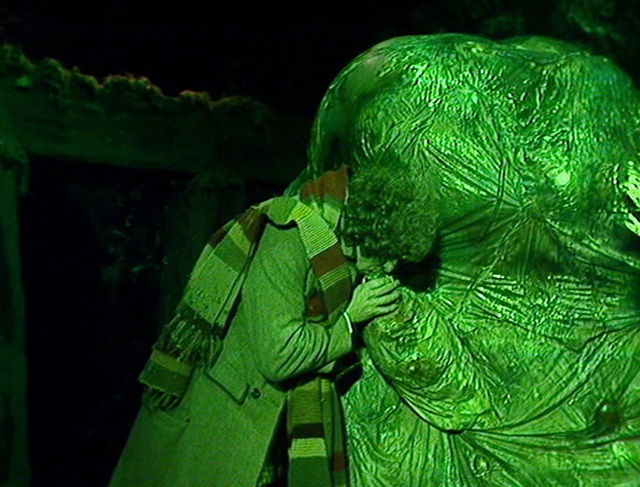 On October 20th 1979 Doctor Who recorded its highest ever viewing figure. At 6.16pm that Saturday evening, 16.1 million people were tuned in for part four of City of Death. ...I'm not quite sure myself! 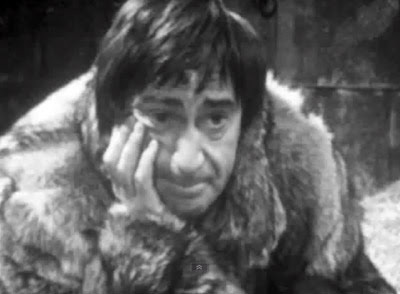 The Second Doctor's looking glum. He's just found out about the BBC's junking policy and how, even though it's only 1967, they've already started wiping his stories. Episode four of The Abominable Snowmen would be one of the those destroyed, and despite the best efforts of search and rescue teams it is still missing from the BBC vaults, so only the 7.1 million who tuned in that Saturday have seen it in all its glory. Also on this day in Doctor Who history part four of The Pirate Planet was broadcast in 1978 at 6:22pm, and watched by 8.4 million viewers. Back in 1966 it was almost time to call time on the first Time Lord. Part three of The Tenth Planet was broadcast at 5.54pm and watched by 7.6 million viewers. Then, in 1977, it's Fourth Doctor time with part four of The Invisible Enemy, which had an audience of 8.3 of Britain's finest. Now, let me share a little tale with y'all. The year was 2006, and BBC Wales had won the use of a helicopter for an evening in a local Variety Club Sunshine Coach fund raising raffle. 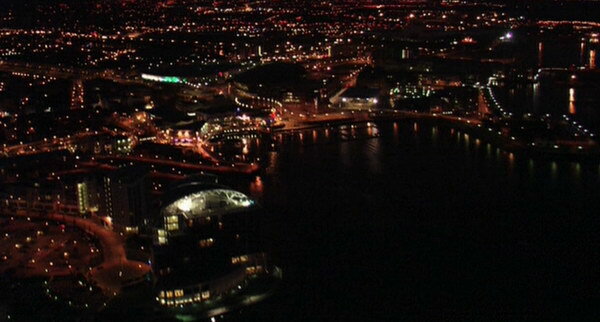 Naturally they decided to fly over Cardiff all night filming aerial views, but then found themselves left with a bit of a problem. Not knowing what to do they turned to Russell T Davies who wrote a little show called 'Cardiff By Night' solely to accommodate the 11 hours of footage they had. When they showed the result to the Director General of the BBC he loved it, but suggested that RTD include 86% more swearing and shagging (two of the DG's favourite things). 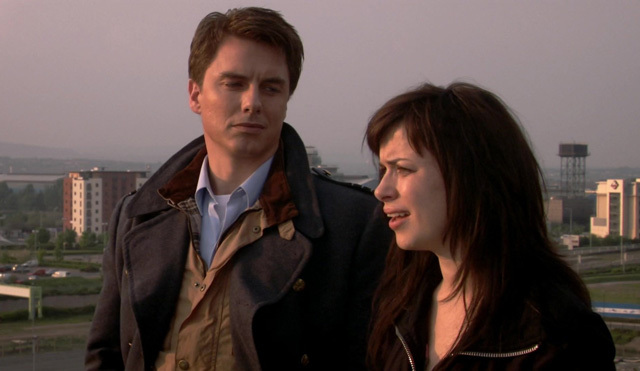 The result was Torchwood. Yes, Doctor Who's post-watershed spin-off got underway on this day in 2006 with a double bill of episodes, which managed to deliver on all three counts - there was Cardiff by night, there was swearing and there was shagging. Really, what more could a Doctor Who fan want? Everything Changes was broadcast at 9:00pm and watched by 2.52 million viewers, pretty much everyone stayed around for Day One which began at 9:52pm and was watched by 2.50 million viewers. Also on this day in Doctor Who history, because it's almost compulsory now, we have two more stories from The Sarah Jane Adventures for you. From season one, on this day in 2007, 1.08 million were tuned into part one of Warriors of Kudlak, then two years later episode one of The Mad Woman in the Attic drew an audience of 0.75 million. Right back up the top there we said two spin-offs debuting, and it's true in a round about way. For if you're reading this sometime after Saturday October 22nd 2016 then this day will be in Doctor Who history and chances are you've watched the opening two episodes of Class. For Tonight We Might Die and The Coach With The Dragon Tattoo will premiere on BBC Three ahead of a BBC One showing.